Potato salad is one of those outdoor party staples that seems to be fading the limelight. I'm not sure if its because everyone is getting more health-conscious or if tastes are just changing. I, myself, have never been big on the classic potato salad. There are decent ones out there, but it just doesn't seem to appeal to me these days. Maybe it's the odd combination of ingredients being slathered with mayo...or maybe it's just the thought of cold potatoes that have steered me away. I decided to try a new version that didn't have all that heavy mayo and was warm; something you don't usually see at the picnics, potlucks, or parties. I wanted the classic potato accompaniments, but done in a lighter way. It was extremely easy to make this take on an old salad staple and I'm really happy with how it turned out. It wasn't drenched in dressing and it wasn't a shockingly, cold accompaniment to the other food. So, if you're looking for something a little different that won't bore the party, give this revamped potato salad a try. 1. Boil a large pot of water. 2. Cut potatoes, skin on, into 1" pieces and add to the boiling water. 3. Return water to boil and boil potatoes for about 5-7 minutes or until just tender. Be careful not to overcook or they will be mushy. 4. 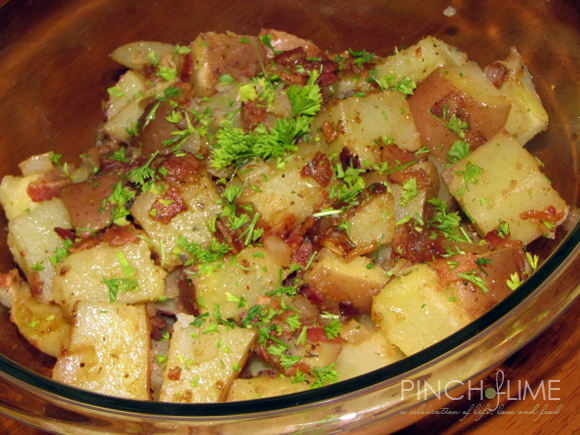 While potatoes cook, mix dressing ingredients and set aside. 5. Drain potatoes when done cooking and set aside. 6. In same pot, cook bacon until almost crisp. 8. Add onions to pot and cook over med-low heat until soft, scraping the bottom of pan when you stir. 9. Add potatoes and bacon back to pot and carefully stir so potatoes don't break. 10. Pour dressing over potatoes and stir again. 11. Garnish with parsley before serving.